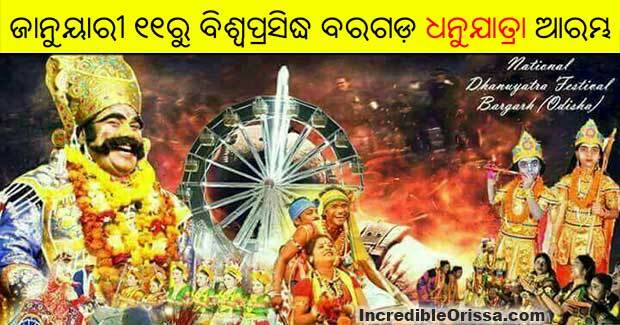 World famous Bargarh Dhanu Yatra is all set to begin from 11th January 2019, announced Bargarh District Collector Indramani Tripathy. The event which will set the stage for all mythological places related to Lord Krishna based in the ancient city itself. While Bargarh will stage Mathuranagari, Ambapalli area will stage as Gopapur the parenting place of Krishna, Jeera River will set as the Yamuna river for the acts, Hatapada mandap will be Raj darbar of King Kans. The event will entertain the visitors from all over the state and country for 10 days. In the meantime all the powers of the administration will be curbed as a virtual kingship by King Kansa will rule the entire district. Dhanu Yatra is an annual drama-based open air theatrical performance celebrated in a 6 km radius in and around Bargarh municipality. It is considered to be the largest open-air theatrical festival. Preparations for the event are in full swing. we have made all proper arrangements like every year, a senior administrative official said. The world famous annual festival will conclude on January 21. The festival is being held in Bargarh since 1947. Dhanu Yatra begins with the King of Mathura Kansa ascending the throne and ends with Lord Krishna killing his uncle.